Most fad diets that promise fast weight loss violate the basic principle of healthy eating -- eating a variety of nutritious foods. The Marine commando diet, also known as the Royal Marine commando diet, is a fad diet. It limits your intake to specific foods and promises a 1- to 2-pound daily weight loss. Consult your doctor before starting any weight-loss diet. The Marine commando diet is a seven-day diet that includes a detailed meal plan of what to eat each day. 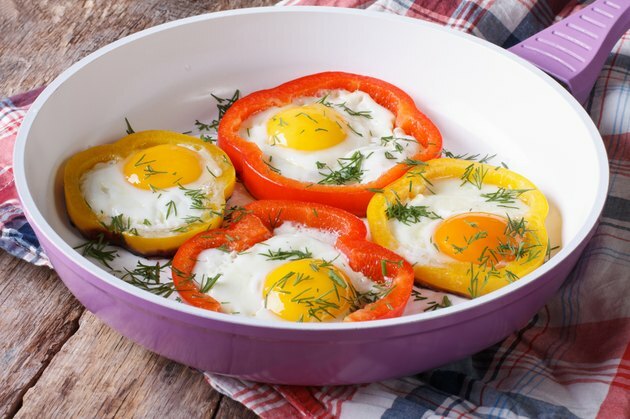 Day one of the diet plan is the most restricted, limiting your intake to three eggs at each meal for a total of nine eggs for the day, which you're allowed to eat poached, boiled or scrambled without oil. On day two, you're allowed to eat one egg or a grapefruit for breakfast, fresh fruit salad at lunch and steak with tomatoes, celery and cottage cheese at dinner. Your breakfast option remains the same throughout the diet, while lunch alternates between fresh fruit salad, garden salad or fish with tomatoes and spinach. Dinner usually includes a protein such as steak, ham or lamb chops with salad and tomatoes. On day four, you are allowed to eat three eggs and one to two slices of toast at dinner. The diet does not include serving sizes but suggests you be "sensible" with portions. The Marine commando diet is a low-carb, low-calorie diet. While portions are not provided throughout most of the diet plan, it helps you limit your overall calorie intake and lose weight by severely limiting your food choices to high-protein foods and low-calorie fruits and vegetables. On day one, for example, your total calorie intake is less than 700 calories. Very low-calorie diets of 800 calories or less are not recommended unless under the guidance of a doctor. The egg-heavy diet may not be appropriate for everyone. Eggs are a source of cholesterol, and if you have high cholesterol you should eat no more than four to six eggs a week, according to the Cleveland Clinic. The diet also severely limits or omits major food groups, including grains and dairy. Proponents of the Marine commando diet say you can lose up to 14 pounds in a week. Most health care professionals recommend you lose weight at a rate of 1 to 2 pounds a week. Losing weight too quickly likely means you’re losing water and muscle and not fat, which may leave you feeling tired and rundown. You are also more likely to regain the weight you lost when you lose it too quickly, according to FamilyDoctor.org. If you want to lose weight and keep it off, following a fad diet like the Marine commando diet is not the way to go. A healthy weight-loss diet plan should include a variety of nutrient-rich foods from all the food groups, including fruits, vegetables, whole grains, lean sources of protein such as fish and beans, and low-fat or nonfat dairy. Eating a variety of nutrient-rich foods promotes good health and prevents diet boredom.